The numbers have not added up for the Morecambe camp so far as they go into Saturday’s match against Macclesfield Town. They have had seven defeats in eight league games this season and with 17 goals conceded – six of those on the opening day. Their one victory against Northampton Town was only the Shrimps’ fourth in 31 league and cup matches during the calendar year so far. Another figure causing consternation is the number three; both in terms of points and the number of league goals scored so far this season. It hasn’t been for the want of trying; the win against Northampton and defeat to Oldham Athletic four days later saw the opposition keepers turn in man-of-the-match performances. 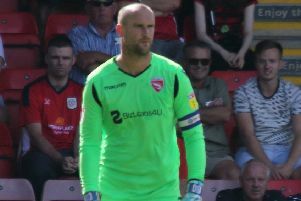 Those struggles in front of goal come despite a more attacking line-up this season with Morecambe boss Jim Bentley able to call upon a number of different options. Joe Piggott, Jason Oswell, Vadaine Oliver, A-Jay Leitch-Smith, Liam Mandeville, Rhys Oates and Kevin Ellison have all figured so far for the Shrimps. Watch as Bentley discusses taking their finishing practice on the training ground into competitive matches.